Are you looking for a Microsoft Surface 3 Sleeve Case? We have done a research and compiled the best sleeve cases that all of them are portable and fashion. We have been lucky to find the best Microsoft Surface 3 sleeve cases that can give your device more protections and functionalities. Microsoft Surface 3 is the perfect productivity device for school, home, and on the go. It features a 10.8″ Full HD touchscreen display with 1920 x 1280 resolution and is fast, responsive, and can run everything you need. When you are transporting your device from one place to another, you need to be sure that your device stays safe along the way. To keep your Surface 3 last for long use and can protect from serious drops, scratches, and any damages, you will definitely need protection from a case, sleeve or bag. If you are looking for a great sleeve case then allow us to give you a helping hand. In this article, we will list down the best sleeve cases that are not just designed for only protection but for the fashion too. This ProCase wallet sleeve case is made to fit well with your Surface 3. The exterior of the case made from a premium composition of leather that looks stylish and can protect your device at the same time. A soft microfiber has been used as interior to prevent scratches. This sleeve case has a special interior cut which allows you to charge your Surface 3 and keeping your Surface Pen within the case. This case also has a back large pocket you can keep documents, smartphones, and other small devices. 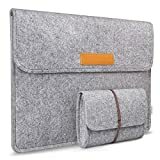 The Inateck Felt case made of high quality felt gray from outside and soft flannel from the inside. This case with a size of 12.2 x 9.0 inches and internal dimensions of 11.6 x 8.2 inches is perfectly fit the Microsoft Surface 3. This case has two additional back pockets for keeping your phones, earphones, pen, other devices. It also has another pocket in front of the main compartment for storing mouse, power adapter, and other devices too. 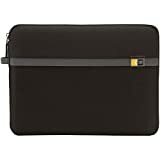 The following one is a slim envelope sleeve leather case from Evecase that is specifically designed for Microsoft Surface 3. The overall dimension of this sleeve case is 11.8″ x 0.12″ x 8.26″ that perfectly fit the 10.8-inch Surface 3 with or without Surface Type Cover. This sleeve case made from durable high-quality synthetic PU leather with fall grain texture for excellent scratch resistant and shock absorbing. The interior is made from microfiber inner lining for keeping your device’s screen clean without scratching. This sleeve case using a strong magnetic closure to prevent accidental drops. The last sleeve case is the Case Logic ELS-111 that features a slim and stylus design. This sleeve case is perfectly fit with your Surface 3 tablet. It made from the durable polyester exterior with Rip Stop material accent and gray webbing trim. You can easily to slide in or out of any bag. This sleeve also has a webbing finger loop that easy when you want to lift this sleeve out of the bag. The first sleeve case we selected is leather sleeve case that made specifically for Microsoft Surface 3 from Snugg. The overall exterior is made from high-quality PU leather with splash proof. The interior of this sleeve is made from a soft nubuck fiber that can prevent your device from scratches and scrapes. This sleeve has two compartments, the main and the rear one. Under the flap, there is also has a built-in card holder to store business cards. The rear compartment has a large room for storing your papers and documents. Those are the top sleeve cases that can provide the best protection with a stylish design for your Microsoft Surface 3. If you want a light-weight and a stylish design, you would probably choose a case from Snugg, ProCase, and Evecase. 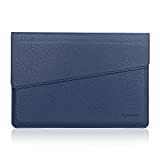 To whom that likely to keep all important accessories along with you everywhere, you should consider the sleeve case from Inatek as it has additional pockets. We appreciate hearing your thoughts, questions, and ideas about “The Best Microsoft Surface 3 Sleeves for 2019”. Please post respectful comments and on topic. We will be replying back to you as soon as possible. Share your idea about "The Best Microsoft Surface 3 Sleeves for 2019".